“More empathy means more profit” declares the headline in The Guardian. The article quotes Satya Nadella, CEO, Microsoft urging that empathy is core to the innovation agenda in the company. An article in The Wall Street Journal also asserts that “more businesses are emphasizing the trait [empathy] in developing managers and products,” and that empathy training at companies is on the rise. 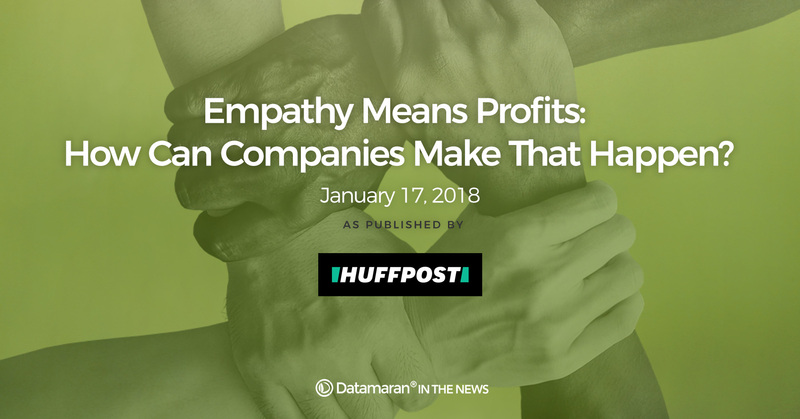 Yet the article cites experts noting that empathy takes a while to develop, and that few companies actually measure the results of empathy training. Empathy is developed through experience, not training. Some skills can be taught: computer skills, for example. Even better listening skills can be taught. But it’s doubtful that people can be effectively trained to be empathetic. Instead, empathy is a skill that is best developed through experience. 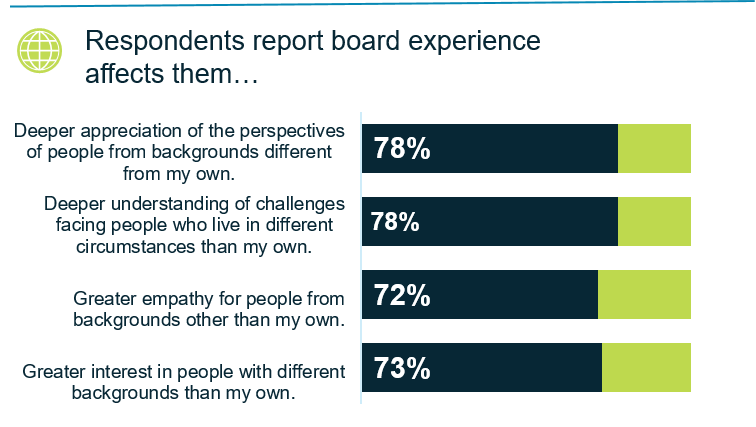 In fact, the Better World Leadership Study, published at the end of 2017, reveals how business people develop greater empathy for people from different backgrounds than their own: through nonprofit board experience. Additionally, business people who serve on nonprofit boards gain deeper appreciation of the perspectives of people from backgrounds different from their own, and deeper understanding of challenges facing people who live in different circumstances than their own. The Better World Leadership Study was conducted by Korngold Consulting with the support and participation of American Express, Dow Chemical, HP, Johnson Controls, PIMCO, Symantec, Datamaran, and the World Environment Center. The study’s conclusions and recommendations are derived from an analysis of lengthy surveys completed by 957 employees at five of the sponsoring companies, in addition to a few dozen interviews, and big data trend analysis. Nonprofit board service advances priority goals for businesses. Fostering economic development and achieving the U.N. Sustainable Development Goals (SDGs): Business people who serve on boards strengthen communities where their company’s employees and customers live and work. Board engagement also helps to advance U.N. SDGs, including addressing hunger, good health and well-being, quality education, gender inequality, decent work and economic growth, reduced inequalities, sustainable cities and communities, climate action, and peace, justice, and strong institutions. The level of satisfaction among those who serve on nonprofit boards is compelling. Nearly every respondent reported that the work of the nonprofit is meaningful to them (97%), that they are able to add value (95%), and that they would recommend nonprofit board service to their friends and colleagues (99.5%). The majority of respondents serve in leadership positions on their boards (81%), some serving on multiple boards and in multiple leadership positions. The data also show that employees are more likely to work and stay at companies that introduce them to boards and provide financial contributions to the nonprofits where they serve. The insights in this report about employee board service can inform companies seeking new and effective approaches to grow their value. Given the positive reception to board service by employees, it seems that increasing and enhancing board opportunities through company training and matching programs would be a win-win-win for companies, their employees, and communities.